As EVERY workman knows, timber shrinks very much more transversely than in the direction of its length. But the contraction of a board or plank is not always in the same direction. It is regulated by the part of the tree from which it is taken. I have not space here to give the laws, for there are fixed laws in this as in other branches of science. I will content myself with stating as concisely as I can their result. In conversion, a tree always shrinks or contracts in the direction of its circumference; that is, the wood shrinks more on the outside than at the heart. Thus, if one cuts from the middle of the tree a plank having the heart in the center, and leaves it to dry, there will be but little decrease in thickness at the middle of such a plank; but toward the edge the reduction in thickness will be considerable. It will also be noticed that this plank does not bend or warp to any great extent. 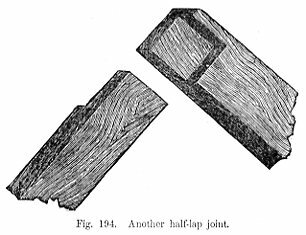 The planks or boards taken from that part of the tree next adjoining the heart, will also retain their thickness to a great extent in the middle, and will also evince the same tendency to shrink at the edges; but it will be observed that they are inclined to bend or curve outward from the heart. The planks from the outside will lose little of their thickness, but will show signs of bending still more from the heart; consequently they decrease considerably in width while seasoning. 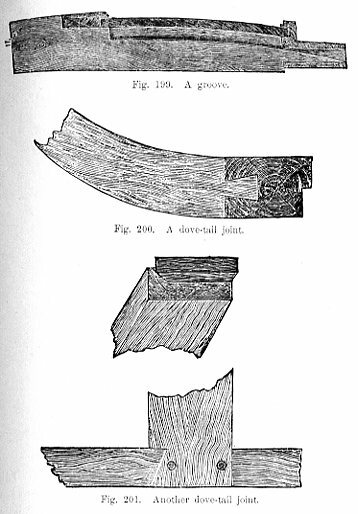 Thus, if the body maker takes the trouble to acquaint himself with this highly interesting subject, he may, by simply examining the end grain of the wood to ascertain from what part of the tree it has been cut, be able to choose and apportion his timber in such a manner that his work will not afterward fail by reason of shrinkage and bending. A subject that might with very considerable advantage receive greater attention at the hand of those responsible for the conduct of our technical classes is the science of carpentry or joinery, which may be defined as the art of framing timber for the purposes of structures in which any considerable weight or pressure is to be supported. A brief instruction in the principles of this science, and particularly in that branch which treats of joints, enables a workman to connect his framing with a due regard to the nature of the strains the various pieces are intended to resist. In coach body making there are several complicated joints adopted that are never seen in ordinary joinery; but again there are other joints in this art that never occur in body making. Those used in a carriage body are known as framing joints, the most general being those on the principle of a tenon and a mortise. Such useful rules as the following are worth remembering: No joint can be made so good as by its own stiffness or resistance to motion to add anything to a framing. The strength of a wooden framework should depend not on the stiffness of joints, but chiefly on the arrangement of the timbers. No joint should be used in which shrinkage or expansion can tend to tear the timbers. Tenons are best made a third of the thickness of the timber they are cut from. 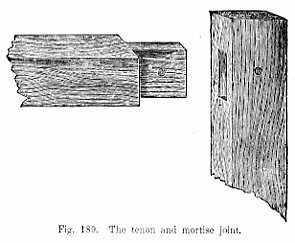 When tenons have not only to resist lateral displacement, but a strain tending to draw from the mortises, they must be pinned or wedged. Pinning is the general practice of the coach body maker, who drives a wooden draw-pin through both the tenon and the sides of the mortises. He is also careful to see that the grain of the wood at the tenon is not twisted, and that two pins are not driven in the same line. The accompanying diagrams show examples of the commonest joints used in carriage bodies of various kinds. The rough sketches are made more with a view to depict the formation of the joint than to represent any part of a carriage framing. Fig. 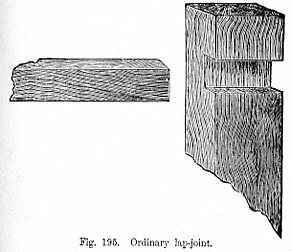 180 (page 184) is a fair example of the tenon and mortise, the neatest of all joints. Fig. 190 (page 185) is a joint in which the tenon is very short, and is known as a stump tenon. It is sometimes used at the foot of a gig pillar. Fig. 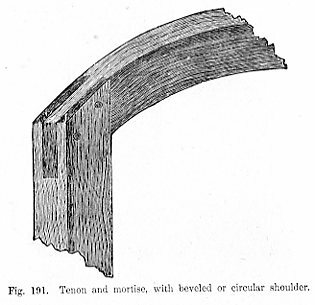 191 (page 186) is another variety of the same joint, and Way have a beveled or circular shoulder, as in the seat rail and pillar of a gig or Stanhope phaeton. Fig. 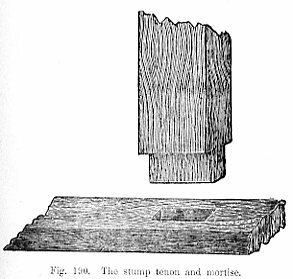 192 (page 187) is another variety of tenon, and has only one haunch or shoulder. It is called the bare shouldered tenon. Figs. 193 and 194 (pages 187, 188) show what is known as the half-lap, now very largely used in cheap work instead of the mortise and tenon. Fig. 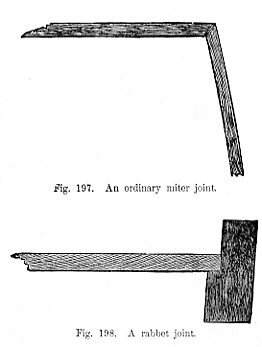 195 (page 189) is an ordinary lap-joint used in inserting battens, &c. Fig. 196 (page 189) is a double tenon joint, sometimes used in framing the elbows into the corner pillars of such carriages as landaus. Fig. 197 is an ordinary miter joint, such as is used at the top quarter panel of a brougham to conceal the end grain of the wood. The adjoining edges are cut at an angle of forty-five degrees. Fig. 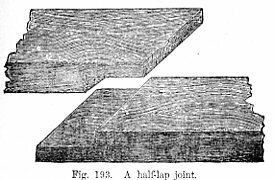 198 is a rabbet joint, a ledge for bottom boards and similar purposes. Fig. 199 is a groove. This is necessary for the insertion of panels, &c. Figs. 200 and 201 are joints that are used in some instances�the first for fixing a circular front to brougham pillars, and the second in framing the boot cross-bar.�By John Philipson.